As I take a deep breath and steady my hands, I only imagine how hard it’s going to be to put into words how much The Messenger has surpassed my extremely high expectations and solidified itself as one of the best games I’ve played this decade. When I first discovered The Messenger through a Nintendo Direct my interest was piqued and I needed to know more. Upon having the chance to play through parts of the game at PAX East, I knew this was something special. It reminded me how it felt when I played Shovel Knight for the first time and that made me anxious and cautious because I knew it would mean that my level of hype for this game could eventually lead me down a road of regret, having built it up too much in my brain. Though, as I stand here–well, sit in the chair at my local coffee shop– I can wholeheartedly assure you that after achieving a 100% completion of The Messenger, the few games that are set to come out the remainder of this year are going to have to make my brain explode in order to take my Game of the Year stamp away from Sabotage Studios. Okay, and now to back up my claim. 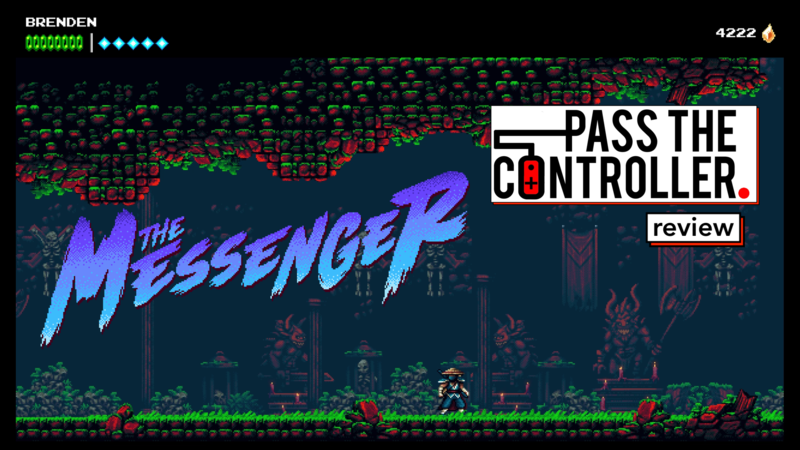 The Messenger is a platformer that relies upon precision movements and attacks in order to progress, and even more so if you’d like to acquire all of the collectibles and rewards in the game. With this focus on the game not pulling its punches and the player having to maneuver through a painstakingly crafted world, the movement and execution needs to be immaculate. It is. When you’re gliding through the air and slashing to bounce off of enemies or lanterns in order to cross gaps or traverse to hidden areas, every button input feels as responsive as it needs to be and when you plummet to your death you can only blame your fingers and not sloppy mechanics. Though, one of the balances in place to help alleviate some players who may not be as skilled, are frequent checkpoints that will allow you to not have to continually start from the beginning of an area. Over the platformer’s progression, you’ll acquire new items to flesh out your arsenal allowing you to traverse in interesting and sometimes flashy ways. There’s also a skill tree that allows you to upgrade various stats and skills, though it’s not too deep and doesn’t necessarily award the game with what some might consider to be RPG elements, but it does offer some tiered goals to work towards while playing. One of the the few negative things I can attribute to The Messenger— there’s not many– is that I feel as though I completed the skill tree rather quickly so it left me wondering what else to do with my collected gems. There is another optional use for them later in the game, I just chose not to spend my gems that way. Though, this minor blemish didn’t really hinder my enjoyment of the game in anyway. For a video game that’s an ode to retro platforming, you may not anticipate it having any depth to the story outside of being a ninja with a quest, but the journey ahead is filled with unexpected turns, wonderfully written comedic dialogue, and a world you’ll want to continue delving into. Even though the slick gameplay was enough to keep me moving, the narrative at work and the characters involved were what made me double down on my motivation to bring my Switch with me into the bedroom every night. The shopkeeper and Quarble standout as two of the most memorable performances in the game, but that might also be because of their constant presence throughout your adventure. Each section of the world you travel to you will encounter dozens of notable interactions that breath life into the inhabitants– whether it be a tale from the shopkeeper, a quip about your death from Quarble, or the next story beat. Between the moments when I laughed, there were times when the narrative would move in ways that were truly unexpected and ultimately led to a very satisfying ending– except the fact that the game was over. The Messenger does an exquisite job of creating a serious platformer, with serious attention to detail, while existing in an insouciant state coupled with self-awareness that when done poorly can seem like a cop-out or lazy writing, but with the execution here it’s one of the best pieces of game writing I’ve played in a long time. The Messenger is unrivaled with how they manage the players expectations. At first you may think you have this game pegged as a retro platformer, but as soon as you think you know the games core Sabotage Studios shatters what you know and introduces new game elements and mechanics all delivered impeccably. There’s no secret there is a transition that occurs between 8-bit and 16-bit, and though some may see this as a nostalgia gimmick looking to pander to your childhood, it actually plays into the narrative as well. Beyond it looking and sounding incredible when the swaps transpire, this graphical and musical shift comes into affect when the game transitions from being a straight platformer to a Metroidvania. Traveling to places you’ve been before as well as all new lands, this second half of the game truly blossoms into something beautiful. One of the ways in which The Messenger creates an avenue for players who may not be as keen on a Metroidvania is the option to offer up your gems to the shopkeeper for hints as to where to travel to next. This is what I was referring to earlier about another option to spending my gems that I chose not to partake in. I feel like this addition of an optional way to allow less skilled players to progress is a smart way for Sabotage to make the game they want while still offering up something more palatable for those not looking for the challenge. Another note that I want to touch on is the sound design. With an original score from Rainbowdragoneyes, we are given an 8-bit and 16-bit version of each track that help solidify The Messenger as a complete package. There are certain songs within the game that not only evoke emotions tied to memories of my gaming past, but truly cement themselves as memorable tracks that I will continue to listen to amongst my other favorite pieces of gaming music. As someone who didn’t grow up with a strong nostalgia for Ninja Gaiden, have a little history with Shinobi, but ultimately had no strong feelings about playing something that so many people refer to as a spiritual successor to Ninja Gaiden, I feel as though that analogy is a disservice. Similar to how other games get pegged into specific characterizations, I feel as though The Messenger uses its inspiration from many great old school games– from both the 8-bit and 16-bit era– as a foundation that they then built upon with modern game design principles that make sense for this generation of gaming. The Messenger is no question my favorite game of this year, one of my favorite games in recent memory, and one of those games I will be recommending to everyone who owns a Switch– or I guess Steam too if that’s your thing. It excels as a platformer with top tier level design, it’s written and scored phenomenally, and has set the bar for what to expect from anyone in the industry– indie or AAA– who wants to create a masterpiece. I will be keeping my eye on Sabotage Studios for whatever adventure they embark on next. But until then, cheers to them for creating something so memorable that oozes passion.